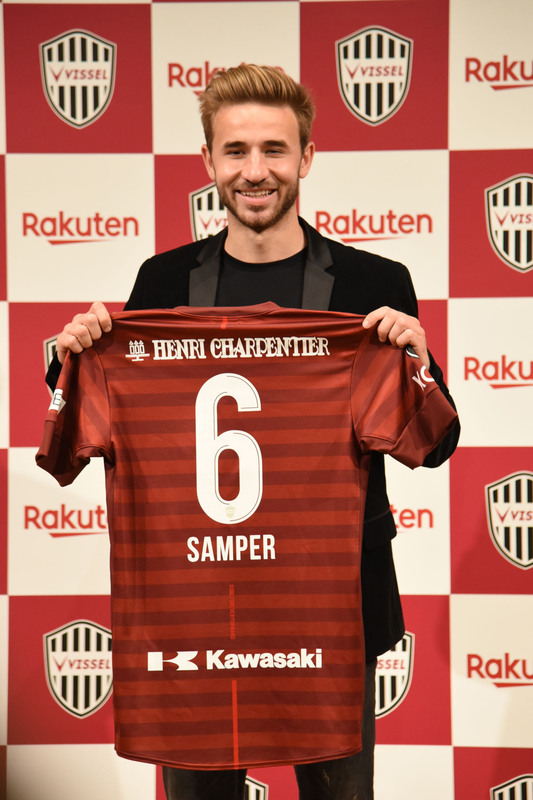 Vissel Kobe has added another name to its ever-growing list of Barcelona connections. The J. League first-division club announced on Thursday the signing of defensive midfielder Sergi Samper, who will become the third player to trade the famed Spanish side’s blue and red for Kobe’s crimson following the 2018 arrivals of midfielder Andres Iniesta and striker David Villa. The 24-year-old Samper rose through Barcelona’s famed youth academy and wore the captain’s armband at each level along the way. He regularly trained with the first team and impressed in over 100 matches with Barcelona B but struggled to earn playing time after promotion to the senior squad in 2016. Samper made 22 appearances on loan to Granada in the 2016-17 Spanish first-division season. He joined Las Palmas in a similar arrangement for the following season, but played in just two games before suffering a devastating broken ankle. At a news conference in a downtown Tokyo hotel, club chairman and Rakuten founder Hiroshi Mikitani was eager to introduce his latest marquee signing. “We are instilling strong, attractive possession soccer and becoming Asia’s No. 1 club not just with our top team but at each (academy) category,” Mikitani said. The move was aided by the relationship between Mikitani’s Rakuten and Barcelona, who are in the second year of a four-year uniform sponsorship deal. “Our relationship has increased since Rakuten became Barcelona’s sponsor,” said Mikitani. “In terms of players we’ve added Iniesta, Villa, and now Samper. After joining Mikitani on stage and signing his contract, Vissel’s new star greeted the assembled crowd of nearly 100 media representatives. “This is a very important day for me,” said Samper. “I want to thank (Mikitani), the club’s sporting director, and everyone at Vissel Kobe for believing in me. The potential to play with two of Spain’s most famous players was certainly a key selling point for Samper, who spoke to Iniesta on the phone prior to the move. 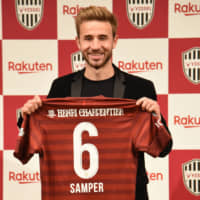 Samper, who is often described as a smaller version of Barca and Spain star Sergio Busquets, was bullish about his new destination, having watched several of Vissel’s matches in advance of his arrival.